When evaluating and comparing different types of foam, one of the two most important ways to measure these materials is density (firmness being the other). 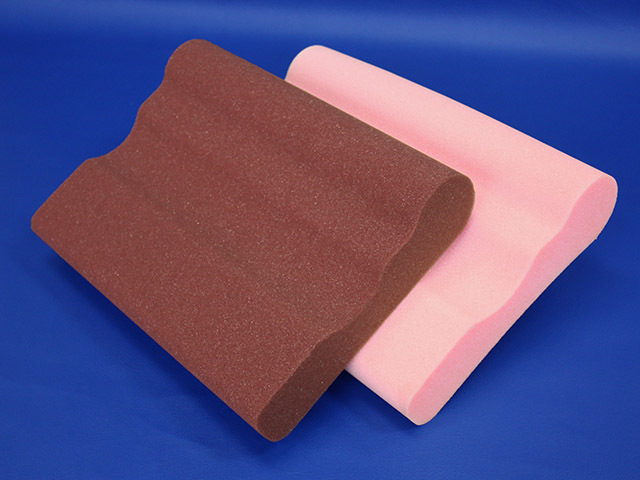 In regard to conventional foam, understanding this density trait can help you pick out a foam type or product that best meets your requirements, whether you need something for bedding, comfort, packaging, or any other project. But with memory foam, the meaning of density is somewhat different. 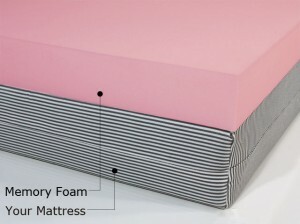 To help explain how and why density is so unique when applied to memory foam, we at The Foam Factory wrote this post to help clarify a potentially confusing topic! To begin, it’s important to understand that despite differences in physical structure and makeup between conventional and memory foam (namely, memory foam’s heat-sensitivity and visco-elastic additives), density is measured in the same way for any type of foam. All that it requires is the weighing of a 12″ x 12″ x 12″ foam sample. That registered weight is reflected, apples-to-apples, as the material’s density. If the test shows that a 12″ x 12″ x 12″ block of foam weighs 2.8LB, that foam’s density is also 2.8LB. In any variety of foam, memory included, density can be used as an indicator of quality, longevity, and resilience. Look at it this way: if you have two materials of the same size, and one weighs more (giving it a greater density), there is more physical performance material in the heavier product, which will take longer to break down over time. This means the heavier material – the one with the greater density – will last longer. Therefore, the greater the density of a foam material, the greater the longevity and durability it possesses. The reason memory foam differs from standard foam materials with its density characteristic has to do with the fact it is formulated to be a reactionary material. Conventional foam is non-reactionary in the sense that it responds strictly to the physical pressure applied to it. When it is released, its forming is released as well. But with visco-elastic compounds, memory foam reacts to more than simple pressure. With the warmth of your body activating the material, it softens and yields in areas with higher pressure, creating a unique contouring effect different from conventional foam. And while different manufacturers may use different formulations, when dealing with higher density materials, there should be more of that visco-elastic material in the greater density, irregardless of the specific blending balance of memory compounds to conventional polyurethane compounds. This means a few things for a person in the market for a new memory foam mattress, memory topper, pillow, or any other product. Firstly, they can expect longer and more precise contouring in higher density memory foam, vs lower density. More of the unique memory ingredients mean that, essentially, the higher density foam has a better memory! While this may seem to be an advantage in favor of higher density materials, it’s better to view it simply as a feature. Personal preference will always dictate what someone likes best, and it’s dangerous to assume just because a material offers the most of one feature, it’s the best for you. That difference in performance can manifest itself in a few ways once in use. While higher density foam will contour more precisely, it can also take longer to form those contours. If you decided to test this with two memory foam pillows, one 3LB and one 5LB, you would notice these differences easily. Placing them side-by-side, and pressing evenly on both pillows with your hands, you would see a few things. Almost immediately, the 3LB would feel softer to the touch than the 5LB, though the 5LB would slowly soften and catch up in terms of softness. This happens as the visco-elastic polymers take in your hand’s warmth and soften. That difference in firmness can be more pronounced when the ambient temperature in a room is lower. Warmer rooms have already “pre-heated” the foam to a degree, requiring less of your body’s warmth to get it to soften. Next, if you released your hands from the pillows after allowing them both to fully soften and form, you would see a much more detailed handprint in the 5LB pillow. Little things like added depth where fingertips added pressure, or even wrinkle lines in your palm. Of course, the 3LB would still show your hand print, but it would display less detail, showing that the 5LB pillow has more visco-elastic polymers, being the higher density material. Also, you would notice the 3LB memory foam pillow fill in your hand print and return to its normal shape more quickly. Over the life of a product, the ability to return to form is a measure of resiliency, but in new memory products, the speed at which the foam returns is also reflective of its temperature sensitivity. Just how it takes longer to form, higher density memory foam also takes longer to return to its original shape. This may make movement a little more difficult in mattresses and toppers for some individuals, as it doesn’t spring back in support as soon as pressure is released. However, that longer memory and contouring means more pressure relief and that “cloud-like” feel many people have come to enjoy from memory products. The level of contouring desired is purely personal preference however, so it’s important to know there is more offered by higher density memory foam than lower. With this collection of density factors, memory foam gives customers a little more to keep in mind than standard foam when debating a purchase. The quick and easy version of it is that higher density memory foam offers a more specialized custom-contoured feel, while lower density offers a more conventional feel while still offering some memory traits for those who want to split the difference between the two. Keeping this in mind, while still remembering that greater density still does indicate greater quality and longevity, can help you make a better-informed decision that will hopefully give you the comfort you are looking for!